Pence on 9/11 anniversary: "We will not be intimidated, our spirit cannot be broken"
Pence on 9/11: "Our spirit cannot be broken"
Vice President Mike Pence and Secretary of Defense James Mattis participated in Tuesday's 17th anniversary of the attacks on September 11th at the Pentagon. The Pentagon was the third site attacked after both towers at the World Trade Center were struck by hijacked commercial jets. 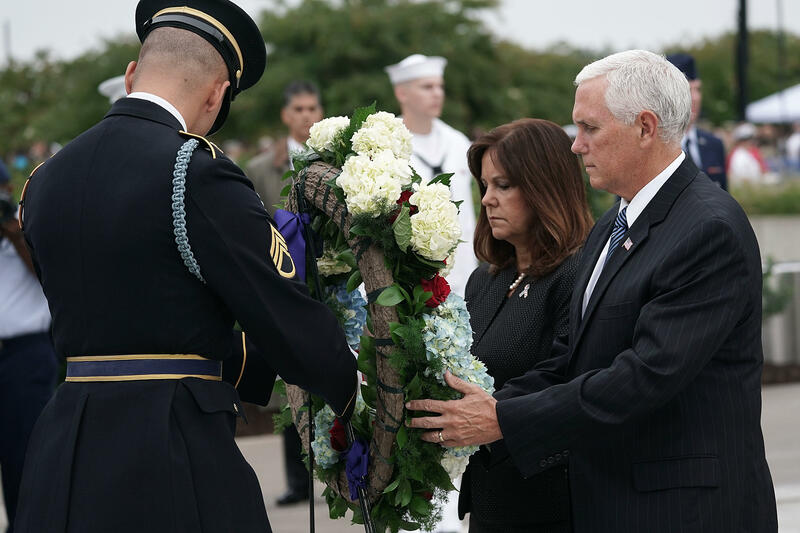 "We will never forget what took place in this place on that fateful morning," Pence said at the Pentagon 9/11 memorial, saying he came to the ceremony to "pay a debt of honor and remembrance." Pence as well as Mattis said that 17 years after the attacks, the nation has remained empowered in its defense of freedom. "We must learn the lessons of 9/11 and remain ever vigilant in the defense of our nation and our people," urged Pence. American Airlines Flight 77 crashed into the nation's military headquarters, setting off fires in a portion of the Pentagon, killing 125 people inside, in addition to the 59 passengers and crew and the five terrorists who hijacked the plane that took off from Dulles International Airport in Virginia. The nation honored those killed in a moment of silence shortly after 9:37 a.m. -- the exact time the plane struck the building. Pence recalled first hearing of the attacks when he was new member of Congress. "I'll never forget that moment, standing in my office when I heard a staffer shout 'the Pentagon's been hit.' When i made my way out the building, and walked onto the Capitol grounds, I'll never forget the site of seeing columns of smoke billowing out of the Pentagon, literally darkening half of that crystal clear blue sky," Pence remembered. The vice president said that the administration was honoring the fallen by "ensuring we do everything in our power to prevent evil of radical Islamic terrorism from ever reaching our shores again." "The evil that descended on America 17 years ago still lingers in our world. So to any who would wish us harm let them know this: as the American people have shown everyday since that bright September morning. President Trump said on these grounds one year ago, 'we overcome every challenge. We triumph over every evil and we remain united as one nation under God.'" Pence and Mattis were just some of the members of the Trump White House marking the solemn occasion. At a Justice Department ceremony, Attorney General Jeff Sessions recalled that on 9/11, he was attending an annual judicial conference at the Supreme Court -- as he would again Tuesday. "Those Flight 93 heroes may well have saved our lives," he said. The target of the hijackers on Flight 93 was thought to be the U.S. Capitol, which is about half a block from the Supreme Court. In the years since 9/11, Sessions noted that there have been attacks more limited in scope by terrorists -- in San Bernardino, Orlando and Brussels, for instance. But also since then, the Justice Department "has secured the convictions of over 580 defendants for terrorism or terrorism-related charges," he said. And the FBI has ongoing investigations in all 50 states. Sessions says he meets with FBI Director Christopher Wray, his counterterrorism team and the National Security Division three mornings a week to talk about the terrorist threats to the U.S. The entire department, he said, is reminded on the anniversary of 9/11 of the importance of its role in trying to stop terrorism. President Trump is marking the anniversary with the first lady in Shanksville, Pennsylvania where another hijacked plane believed to be bound for the Capitol crashed into a field in rural Pennsylvania.